The agreement builds on a long-lasting relationship with the world leader in large diesel engines and also includes outbound transport of ocean freight and an estimated 30,000 yearly express shipments. 1. Speed: get to any destination in the world on time without any delay. 2. Reliability: Deliver on time to prevent any delay. 3. Exception management: Any possible deviation must be identified, reported and corrective actions implemented immediately. 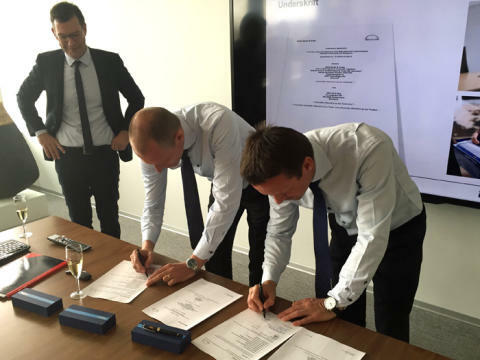 DSV is investing in the extended partnership by integrating EDI-systems and creating a global account team that will cooperate closely with the MAN Diesel & Turbo operations team and coordinate shipments from both Denmark and Singapore. "It is very satisfying to expand our business with MAN Diesel & Turbo. We are building on a long-lasting relationship, but we had to win this part of the business in open competition based on our technical solutions and organisational capabilities," commented Henrik Nielsen, Managing Director of DSV, at the signing ceremony at the DSV headquarters in Denmark. "We are impressed by the flexibility and personal attention DSV has shown us in the process. Also, the implementation has been outstanding up until now, with our customers hardly noticing the change." MAN PrimeServ is the service brand for all MAN Diesel & Turbo products and offer worldwide, round-the-clock service 365 days a year. A global network provides comprehensive and continuous support on all continents.